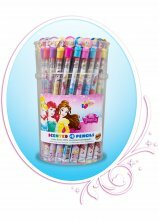 DISNEY PRINCESS SMENCILS Smencils  - $290.00 : FiveStarFundRaising!, Five Star Fundraising, Fundraising and fundaisers for all youth groups, elementary schools, and all non profit groups. The Disney Princess Smencils Come with 10 buckets of 50 Princess Smencils of our scented pencils that are made from 100% recycled newspapers. Each Disney Princess Smencil is a No.2 graphite pencil and is packaged in its own recyclable plastic freshness tube that includes a collectible character top cap! You will receive 10 each of the 5 scents.